Seoul has got a soul! Going back through our pictures and memories it is clear this will be a long post. Our two stays in Seoul were filled with new and interesting sights. And, of course, new and interesting food! After a few weeks in Myanmar we were eager to visit countries that are famous for their cuisine. 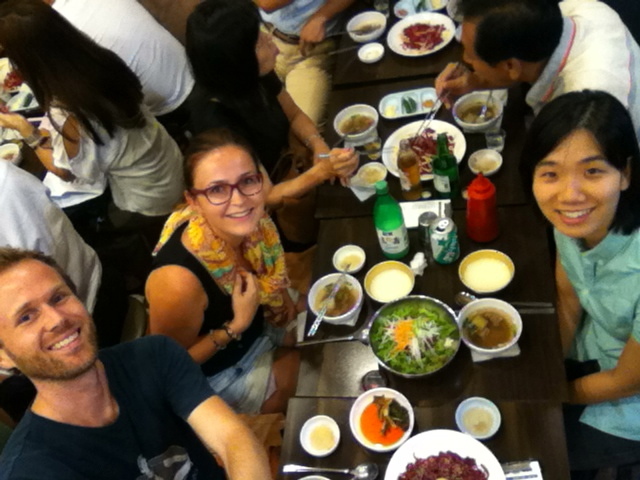 We did enjoy the Chinese and Asia fusion meals in Hong Kong, but we were very curious about Korean food. 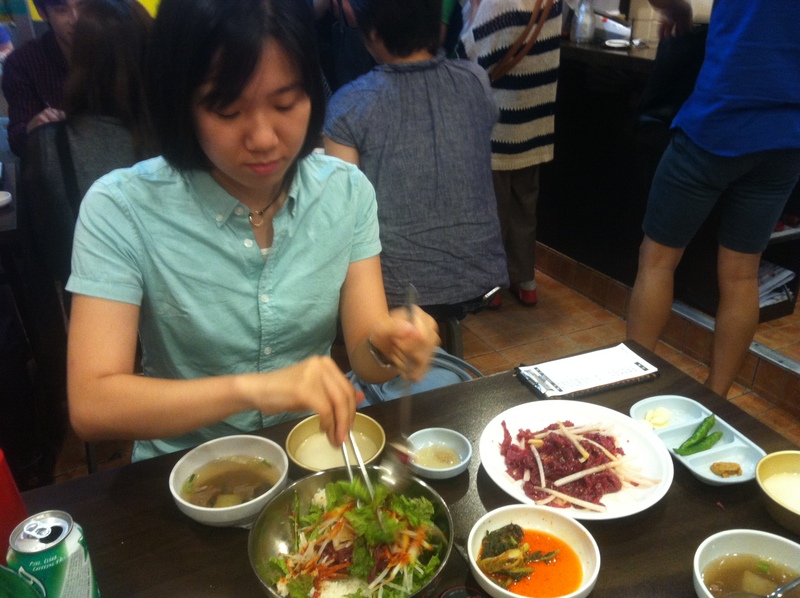 So far we only really knew ‘Korean barbeque’ and the rice specialty – bibimbap – that we used to indulge in in Bahrain. We were not disappointed! It was great to be in a place again where every meal is an experience and something to look forward to. Most of the restaurants have a floor type of seating (yes, you sit on a floor on a thin mat, which requires constant change of position and no, we haven’t mastered the lotus position during our ‘meditation experience’). Unlike the Chinese, Koreans seem to be more environmentally conscious and instead of disposable bamboo chopsticks they use round metal ones. This also means we had to improve our grip technique so the food wouldn’t slip off all the time. We had a chance to sample a wide variety of dishes, for example: bulgogi (marinated grilled meat that you grill directly at the table; what we knew as ‘Korean bbq’), bibimbap (rice mixed with other ingredients), salted mackerel specialty, variety of noodles, pork intestines soup (thanks to our CS host Junsik), various seafood dishes and dumplings. But what we loved the most, and what traditional Korean food is famous for, was the number of little plates served as side dishes. Aways something new, always lots to try out. The most famous being kimchi (fermented cabbage) – an absolute delight! Click on the pictures below to see the descriptions (we are aware most of the pics look very similar!). Just the starters… Including seasnails and silkworms! Mushroom stew and side dishes! We thought Seoul will be one of the cities where it would be great to Couchsurf again. After a first few nights in a hostel (Hostel Korea) we were invited to stay at Junsik’s place. Junsik is a business owner with a lovely 2 bedroom apartment not far from the city centre. Junsik does Couchsurfing, AirBnB and even his business is accommodation related so we knew we would be in good hands. His place was really spacious (we just came from Hong Kong where space is a luxury) and our bedroom was set up almost as a hotel room. The common bathroom was equipped with a ‘sound bell’ which caught our attention. It is basically a bell that for a minute or so plays sounds of running water. As we were explained it is especially useful for people who are worried to be heard while doing their business. Awesome! On the first evening Junsik took us to a local restaurant. He asked us about things we do not eat and we assured him not no worry and that we like everything. We did not think he will order soup full of pork intestines including a Korean version of blood sausage which for Lucia was probably the most edible part. Oops, we forgot to mention! Anyway, the soup itself tasted great, Mark enjoyed it all and Lucia tried her best. Funnily enough, Junsik was probably having a blast, as he did mention, that his foreign visitors usually don’t like it much. Next time, after a walk through the Soul Forrest Park, he chose a safer fish dish. The Soul Forrest Park is a huge park equipped with all kinds of entertainment for the whole family. It was a Saturday and so it was full with kids playing around, couples picnicking and families visiting tropical gardens or feeding deer. Every city should have a park like this! Jimoon was our second CS host who we stayed with before leaving back to Europe. Her place was also nice and similar to what we are used to back home (in terms of space) except for the humongous fridge. Same as Junsik’s, Jimoon’s fridge was double or triple the size of the european one; we guess this is due to American influence in the country. On top of this, on her balcony Jimoon had a ‘kimchi fridge’. Yes, a fridge filled with 6 months stock of her mom’s home made kimchi and other preserved veggies. Already on the first evening Mark included our host in his Ice Bucket Challenge video and then we shared beers while talking about her interesting job at LG. On the next day we met with her after work in the Gwangjang Market, a famous food destination of Seoul, to try out some ‘yuk hoe’ in her favourite restaurant. If you cannot live without a tartar steak, you would love this meal made of sliced marinated raw beef mixed with egg and pear. It was, indeed, like heaven in your mouth! We flushed this delicacy down with some rice wine served in traditional metal bowls. Seoul is a proper Asian metropolis. It has hundreds of historical sights, palaces, traditional villages, but what makes it so typically Asian is the quirky little shops and foodstalls, cute signage, markets, skyscrapers, smartphones, QR codes and great public transport. The Seoul metro has tens of lines but is quite easy to get around in. The metro exits are numbered and businesses use the numbers in their addresses so it’s easy to find them. Once you get on a train it’s hard not to notice what is happening inside. Every single person (including seniors) is looking into their mostly oversized smartphones, watching videos, reading or just playing games. The advertising space in the train must be really cheap here! Who wouldn’t want to shop here!? Apart from transporting millions of passengers, most of the centrally located metro stations along with underground passages and malls serve as bunkers. It is known that 90% of North Korea’s missiles are aimed at Seoul and so the city has got to be ready. Glass cases with gas masks are also placed all around the stations. How is it to live under a constant threat? …we asked Jimoon. Although North and South Korea are technically still in war, positive thinking prevails among the South Koreans. “It will never happen”, you would hear them say. You wouldn’t take it seriously without the cute drawings! Apart from smartphones and gas masks, the metro provides also a good chance to observe the people. Honestly, it is rather difficult to tell some Asians’ age and it feels there is a lot of young people everywhere. What caught our attention were the couples, especially – as we were told – the newly married ones. As if holding hands wasn’t a good enough sign about their mutual affection for the outside world, Korean couples wear same or matching clothes. Sometimes it’s the whole outfit, sometimes only T-shirts, caps, backpacks, or even shoes! It is amusing! Although the city was heavily damaged during the Korean War, Seoul has many historical and cultural landmarks. The Korean traditional architecture is characterised by its harmony with nature and so the palaces and temples are surrounded by greenery that must change into a lovely array of colours in springtime. We visited one of the 5 largest city palaces – Changgyeonggung, a smaller royal residence Unhyeongung, stopped for a picture at Sungnyemun gate and saw guards changing at Bosingak bell tower. The Korean traditional architecture has definitely some Chinese influences. The historical buildings are typical for their the thatched, curved roofs, wooden structures and rows of ‘animals’ standing on the rooftop corners. Our favourite part of the historical Seoul was the stream Cheonggyecheon that runs through the city from east to west. This historical site is now made into a lovely recreational area with greenery, water birds and benches to enjoy this oasis of peace in the middle of the city. There are art exhibitions along the stream and the walls are decorated with reproductions of royal paintings. We were excited to experience some modern culture in Seoul too. Well ahead of our visit we purchased tickets for AIA Real Life NOW Festival with a completely unknown K-pop lineup. Except of one performance that we absolutely knew! When planning our big trip we already agreed we have to go and see PSY if we get the chance. Firstly we wanted to experience the atmosphere of an Asia megaconcert and secondly we really wanted to dance Gangnam Style… After a few hours of performances of surgically enhanced Korean teen stars (that were quite interesting to be honest) we almost missed him while grabbing our next beer! Obviously we didn’t recognise the songs PSY started his show with and so we were lucky we came just in time for his No.2 hit – Gentleman. The place was buzzing but when the first sounds of Gangnam Style came on the crowd went even crazier. It was a great couple of minutes and well worth the visit! Take a look at our pictures selection to see also what we didn’t write about here. We will write about our visit to the DMZ and the South and North Korean Joint Security Area in a separate blogpost. Ako si tak pripomíname náš pobyt v Soule, je nám jasné, že tento post bude trošku dlhší. Počas dvoch návštev mesta sme totiž zažili a videli neuveriteľné množstvo zaujímavých vecí. No a samozrejme, nebude chýbať aj časť venovaná skvelému kórejskému jedlu, ktoré sme tu začali objavovať. Po niekoľkých týždňoch strávených v Myanmare sme sa už nevedeli dočkat znova zavítať do krajín, ktoré sú známe svojou kuchyňou. V Hong Kongu sme si síce pochutnávali na čínskych a iných ázijských pokrmoch, ale naša kulinárska zvedavosť pred príchodom do Kóreje rástla každým dňom. Zaťiaľ sme mali možnosť spoznať tak akurát “kórejské barbeque” a ryžovú špecialitu bibimbap v kórejskej reštaurácii v Bahrajne. V Kóreji sme sa určite nesklamali! Boli sme radi, že sme znovu v krajine, kde sa už po raňajkách tešíme na obed a po obede premýšľame, čo skvelé nás čaká na večeru. Vo väčšine reštaurácii v Kóreji sa sedí na zemi na tenkom matraci (uhádli ste, ani naša “meditačná skúsenosť” nás nenaučila sedieť poslušne v tureckom sede viac než pár minút). Narozdiel od číňanov, kórejci asi dbajú viac na životné prostredie a tak namiesto jednorázových bambusových paličiek sa tam je okrúhlymi kovovými. To pre nás znamenalo nutnosť vypilovať techniku úchopu, aby jedlo vydržalo na paličke aspoň tých pár sekúnd cestou do pusy. Mali sme možnosť vyskúšať veľa-veľa jedál, napríklad: bulgogi (marinované mäso, ktoré si ugrilujete priamo na stole, to je to čo sme poznali pod názvom “kórejské barbeque”), bibimbap (ryža zmiešaná s ďalšími ingredienciami), nasolenú makrelu, rôzne rezancové pokrmy, polievku s bravčovými vnútornosťami (vďačíme CS hostiteľovi Junsikovi), rôzne jedlá z plodov mora, knedlíčky atď. Čo bolo ale na každom jedle najlepšie, a čím je kórejské tradičné jedlo vyhlásené, je množstvo malých tanierikov, ktoré dostanete ako prílohu. Vždy je to niečo iné, niečo nové na vyskúšanie. Najznámejšou takouto prílohou je kimchi (fermentovaná kapusta). Povedali sme si, že Soul bude isto znova dobrým miestom na Couchsurfing. Po pár prvých nociach v hosteli sme boli pozvaný na niekoľko dní k Junsikovi. Junsik je podnikateľ a jeho priestorný byt je neďaleko centra. Junsik robí Couchsurfing, AirBnB a dokonca aj jeho biznis sa točí okolo ubytovania. Vedeli sme, že budeme v dobrých rukách. Byt bol veľmi prestranný (prichádzajúc z Hong Kongu, kde priestor je luxus) a naša spálňa bola pripravená skoro ako hotelová. Spoločná kúpeľňa so záchodom bola vybavená zvončekom, ktorý upútal našu pozornosť. Po stisnutí zvonček na nejakú minútu spustí zvuky tečúcej vody. Ako nám bolo vysvetlené, toto je super pomôcka pre ľudí, ktorí nechcú byť počuť pri… viete čom. Super vec! Prvý večer nás Junsik vzal do lokálnej reštaurácie. Na otázku, či je niečo, čo nejeme sme ho uistili, že si s tým nemá robiť starosti, a že my zjeme všetko. To sme ale netušili, že nám všetkým objedná polievku s bravčovými vnútornosťami vrátane akejsi kórejskej verzie jaternice, ktorá bola pre Luciu asi tou najznesiteľnejšou časťou jedla. Oops, asi sme zabudli spomenúť vnútornosti, kto by to čakal. Polievka ale chutila dobre, Mark zvládol celú a Lucia vyjedla čo mohla. Vtipné bolo, keď Junsik prehlásil, že cudzinci toto jedlo moc radi nemajú – on vedel, do čoho nás ťahá a isto sa na tom bavil! Druhý krát, keď sme boli hladní po návšteve Soul Lesoparku, vybral niečo normálnejšie – rybaciu polievku. Soul Forrest Park je obrovský lesopark vybavení zábavou pre celú rodinu. Bola sobota a tak bol plný hrajúcich sa detí, piknikujúcich párikov a rodín v tropických záhradách a kŕmiacich jelene. Každé mesto na svete by malo takýto park mať! Jimoon bola našou CS hostiteľkou predtým, než sme odleteli naspäť domov. Jej byt bol tiež fajn, podobný tomu, na čo sme zvyknutí doma okrem ohromnej chladničky, ktorá – podobne ako tá Junsikova – bola asi dva či trikrát väčšia, než štandardné európske. Domnievali sme sa, že je to vplyvom americkej kultúry. Navyše Jimoon mala ešte jednu špeciálnu kimchi chladničku na balkóne. Áno, táto bola plná domáceho kimchi a iných fermentovaných zelenín tak na pol roka. Hneď v prvý večer zapojil Mark našu hostiteľku do jeho videa pre Ice Bucket Challenge a potom sme v obývačke popíjali pivo a vypytovali sa jej na jej prácu pre LG. Na druhý deň sme sa po práci stretli na Gwangjang trhu s jedlom aby sme vyskúšali “yuk hoe” v Jimooninej obľúbenej reštaurácii. Ak ste milovníkom tartarského bifteku, tak by ste si určite pochutnali na tomto jedle zo surového marinovaného hovädzieho nakrájaného na pásiky podávaného s vajíčkom a pásikmi hrušky. Nebíčko v papuľke! Pochúťku sme zapíjali ryžovým vínom servírovaným v tradičných kovových miskách. Soul je pravá ázijská metropola. Je tu stovka historických budov, palácov, tradičných dediniek, no to čo robí toto mesto naozaj ázíjským v našich očiach sú podivné malé obchodíky a stánky s jedlom, roztomilé nápisy, tržnice, mrakodrapy a QR kódy a perfektná MHD. Metro v Soule má desiatky liniek, no ľahko sa v ňom orientuje. Východy z metra sú očíslované a podniky uvádzajú čísla v ich adresách, aby ich ľudia našli. Keď nastúpite do metra nemôžte si nevšimnúť, čo sa vnútri deje. Každý jeden cestovateľ (vrátane seniorov) je zahľadený do svojho väčšinou ohromného smartphonu, pozará video, číta, alebo sa hrá hry. Reklamné plochu v metre tak musia byť isto veľmi lacné! Okrem dopravy miliónov pasažierov denne, väčšina staníc v centre mesta slúži zároveň ako bunker. Vie sa, že 90 percent severokórekských striel je namierených na Soul, a tak mesto musí byť v strehu. V staniciach metra tak nájdete aj sklenené vytríny s plynovými maskami. Aké je to žiť pod neustálou hrozbou vojny? … spýtali sme sa Jimoon. Napriek tomu, že Severná a Južná Kórea sú prakticky stále vo vojnovom stale, juhokórejci ostávajú pozitívni. “To sa nikdy nestane”, počuli by ste ich povedať. Okrem smartphonov a plynových masiek nám metro ponúka aj dobrú šancu prezrieť si poriadne ľudí okolo. Úprimne, stále ešte ťažko rozoznávame vek niektorých ázijských národností, a tak máme pocit, že je všade veľa mladých. Mladé páriky – špeciálne novomanželské, ako nám bolo neskôr povedané – sme si všímali najviac. Akokeby držanie za ruky nebolo dostatočným prejavom náklonnosti, kórejskí zaľúbenci sa rovnako obliekajú. Niekedy je to celý outfit, niekedy sa len zľaďujú a niekedy si vyberú rovnaké tričká, čiapky, ruksaky alebo dokonca topánky. Napriek tomu, že mesto bolo výrazne zničené počas kórejskej vojny, historických pamiatok je v Soule neúrekom. Kórejskú tradičnú architektúru charakterizuje harmónia s prírodou a tak sú paláce a chrámy obklopené zeleňou, ktorá určite na jar kvitne prekrásnymi farbami. Zo všetkých pamiatok zme si vybrali jeden z piatich palácov Changgyeonggung, menšiu kráľovskú rezidenciu Unhyeongung, zastavili sa pri mestskú bránu Sungnyemun a pozreli si výmenu stráží pri zvonici Bosingak. Kórejská tradičná architektúra obsahuje mnohé vplyvy z Číny. Historické budovy maju typické taškové zakrútené strechy, drevené štruktúry a rady tvorov, ktoré zdobia cípy striech. Našou najobľúbenejšou časťou Soulu bola riečka Cheonggyecheon, ktorá preteká mestom od východu na západ. Táto historická pamiatka je dnes zrekonštruovaná a premenená na park v strede mesta so zeleňou, vodnými vtákmi a lavičkami. Pozdĺž riečky nájdete napríklad umelecké galérie alebo reprodukcie kráľovských obrazov na stenách. V meste sme zažili aj kúsok modernej kultúry. Dopredu sme si totiž kúpili lístky na festival nám neznámych kapiel tzv. K-popu s názvom AIA Real Life Festival. Z vystupujúcich sme ale jednu hviezdu dôverne poznali! Už pri plánovaní tohto roku sme sa rozhodli, že ak budeme mať tú možnosť, chceli by sme vidieť PSY koncert. Poprvé preto, že sme chceli zažiť atmosféru ázijského megakoncertu a podruhé preto, že sme si chceli trsnúť do rytmu Gangnam Style.. Po pár hodinách vystúpení plasticky upravených kórejských pubertálnych hviezdičiek, ktoré neboli až tak hrozné, sme počas pivnej prestávky skoro zmeškali našu hlavnú hviezdu! Jeho pesničky sme samozrejme nepoznali a tak sme mali šťastie, že sme sa náhodou vrátili tesne pred jeho hitom číslo 2: Gentleman. Celá aréna už dosť dobre fičala, no keď prišiel Gangnam Style, davy ešte trošku viac ožili. Tých pár minút nám určite stálo za to!! Pozrite si tu výber fotiek, aby vám neuniklo niečo, čo sme tu nespomenuli. O návšteve DMZ zóny medzi Južnou a Severnou Kóreou vám napíšeme v separátnom blogu.